It was almost 20 years ago that Family Ties, one of the most popular sitcoms of the 1980s, said goodbye to NBC. Today, the cast returned to the peacock network for their first on-screen reunion. Family Ties debuted on September 22, 1982 and centers around the Keaton Family of Columbus, Ohio. Liberal Steven (Michael Gross) and Elyse (Meredith Baxter) are the parents to conservative Alex (Michael J. Fox), underachieving Mallory (Justine Bateman), and tomboy Jennifer (Tina Yothers). During the sitcom’s third season, Elyse gave birth to a fourth child, Andrew (played by Brian Bonsall beginning in season five). The series ended on May 14, 1989 with an hour-long episode entitled “Alex Doesn’t Live Here Anymore.” It centers around Alex getting a great job on Wall Street and leaving the family home for the first time. The network wanted the show back for an eighth season but the cast and creator Gary David Goldberg felt it was time to say goodbye. The castmembers maintained that they would never do a reunion show and, unlike others, have stayed true to their word. They’ve never reprised their characters. Baxter appeared as the mother of Fox’s Mike Flaherty on two episodes of Spin City in 1997. Gross played Fox’s therapist in an hour-long episode of Spin City in 2000; Fox’s final series regular appearance on the sitcom. Fox, Gross, Baxter, and Yothers briefly reunited for the NBC 75th Anniversary Special in 2002 but that’s as close as we’ve gotten to a full Keaton family reunion. 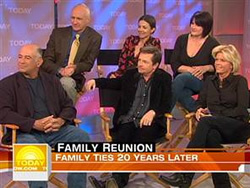 Today, for the first time publicly, Goldberg and his original cast reunited on NBC’s Today Show. Goldberg has written a memoir entitled Sit, Ubu, Sit — named after the familiar vocal tagline of his production company which ended each episode. He was on the Today Show to promote the book and the former Keaton clan insisted in joining him. Apparently, those “family ties” are still pretty strong even after all these years. Stay tuned! The dvd’s are available. You can Google it. I bought the First five seasons and I love it. I will buy the last two seasons soon. You can find the whole seasons in internet and watch it free of charge. I have just watched this TV programme with my husband, son and daughter. I didn’t know why my hubby has been a good husband and father before I watched several episodes of it. It had been a good educational and mind-set training programme for all future family builders. Thanks a lot to the writer and director of this programme series. Wish that I could buy the DVDs in shops in 2011. I will show them all to my kids for their future!